over 3600 sq. ft, but each room has impressive stature. 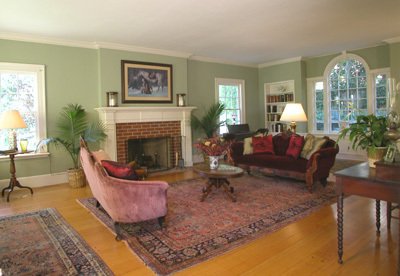 A warm study with fireplace, and a banquet-sized dining room open out from the welcoming entry way. French doors from the dining room lead outdoors to brick “patio rooms” and a charming pergola on this double-sized lot. The grand scale of the living room is matched above with an equally large master bedroom, also with a fireplace. Two additional bedrooms feature fireplaces−a grand total of five in this home! 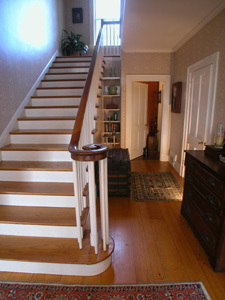 An upstairs study provides partial views of the Bay. There are two full bathrooms upstairs, and a full bath downstairs. The baths and kitchen are waiting to be updated to equal the elegance of the rest of this home! Several cars can park in tandem in front of the separate two-car garage, currently used as workshop and storage space. Ideally located in close proximity to the UC Campus and the “Gourmet Ghetto,” with Chez Panisse, Cheese Board and other wonderful restaurants and shops, a farmers’ market and easy access to transportation. Offered at $1,150,000, this lovely home received multiple offers and closed for $1,350,000.